To strengthen our brand and promote throughout farming in New Zealand and Australia that our product is one of the strongest and most reliable on the market. Founded in 1951 by Bryant and his brother Bill McIntosh, McIntosh Brothers has grown to be one of the country’s top farm machinery manufacturers and the Manawatu’s largest crane hire company. With Bryant trained as a fitter and turner, the pair saw an opening for jobbing engineers. They set up in a Palmerston North back section working in a shed they agreed to renovate as their side of a rent free deal for 6 months. They then moved to Grey Street. During this time they were mainly doing repairs; you name it, they repaired it. In the late 1960s, they brought land beside the North Island main trunk train line and built a concrete and steel workshop. An early production line was for buzzacott sheep showers for Dalgetys. they also produced stock crates for trucks and did general engineering jobs. A staff member who joined in 1961 was Gary Adsett who is still with the company and has been the workshop Foreman for many years. In 1964 they expanded the building and bought a Hastings firm to make stock crates in Hawkes Bay. This was closed in 1982 when all work was moved to Palmerston North. This prompted the purchase of 1.5ha more land. With more stock crates being built they required a crane so the company built its first on a Comer TS3 truck – then a second and a third, until the crane hire became a key part of the business. They made agricultural machinery and parts for Centric GDS bale handlers, swift rear ended loaders and doring implements. Star salesman Bob Potts who joined in 1973, suggested that a feeder wagon built for New Zealand conditions had big potential. In 1973, the brothers were the first to display a forage wagon at the national field days. After the first demonstration, they were mobbed by farmers. 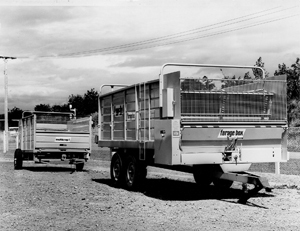 Those were the development days of feeder wagons in New Zealand. Since then the innovations have been more or less continuous. The second generation of McIntosh Brothers entered the company in 1987 with both of Bill’s sons, Brett and Craig, joining the business after gaining experience in financial and engineering fields. Brett now runs the farm machinery division and Craig the cranes and transport division. 1994 saw Bryant bought out of the business due to health problems. His dedication and commitment to the partnership with Bill had been instrumental to the company’s success. The next decade saw major developments with the Farm Machinery Division. They continue to be a market leader through attention to innovation, strength and quality of construction. In 2008, the company had expanded to such an extent that it was decided to move a larger site in Armstrong Street, Palmerston North. Sixty years in business was celebrated in 2011 with many long-term clients and customers attending the event. A third generation joined the business in 2011, with Brett’s son Scott bringing a passion for marketing (BCOM) and truck and crane operations. Bill is still a strong influence in the company in his eighties. 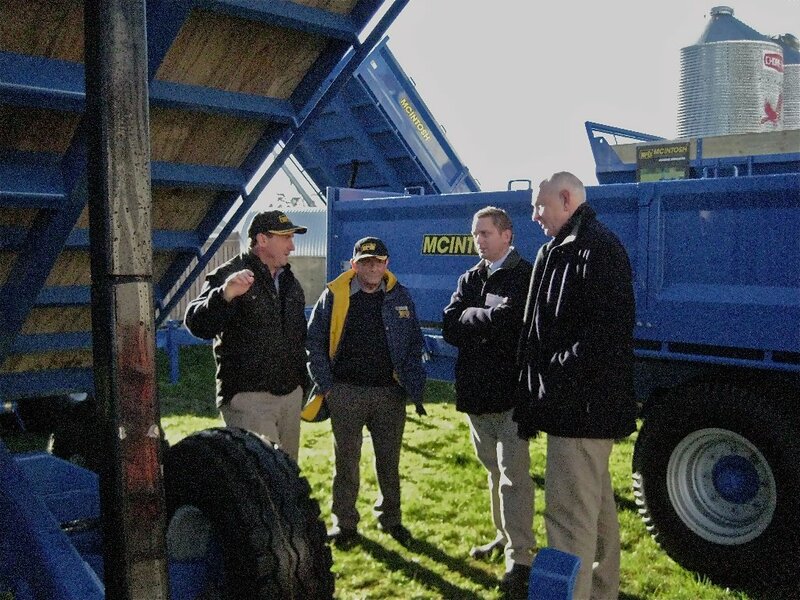 With it's focus on customer needs and quality of product, the farming community continues to use McIntosh Farm Machinery equipment thoughout New Zealand and Australia. This has been helped by a strong loyal New Zealand dealer network and an excellent representative in Australia. McIntosh Farm Machinery now makes forage wagons holding 7.8m3 to 25m2, tip trailers from 4.5t to 17t, single, double and trough bale feeders, manure spreaders 7.5 10.8 13.5 m3 and its new beater wagon from 12m3 to 20m3.